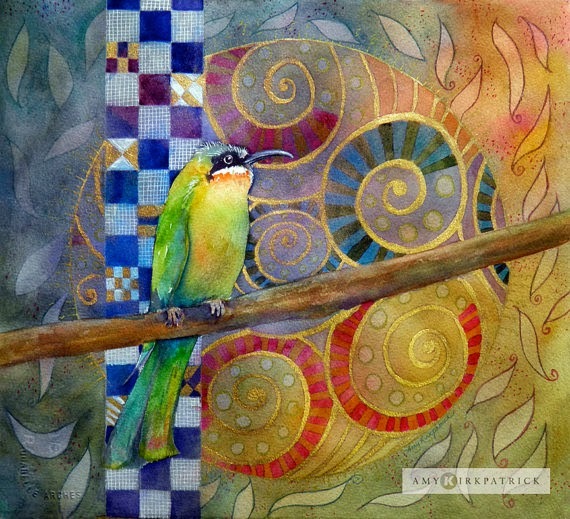 How did I discover artist Amy Kirkpatrick and her gorgeous watercolors? discover an artist who could offer so much more! Enjoy! MBS: Tell us a little bit about your background. How did you start making art? I studied graphic design at Florida State University. I took a lot of painting and drawing courses but what's funny is that I never took a watercolor class. My first job after graduation was working for a check printing company in Atlanta designing checks and bank logos. It gave me an excellent foundation and I've always thought of it as getting my Master's degree, because perfection was required. I moved on into advertising and corporate marketing creating designs for many leading companies. Advertising and marketing are fast paced environments with never ending deadlines and one day, after years of 50 to 70 hours a week, I had nothing left. I burned out. Thanks to my husband, I was able to quit working for awhile. My sister, who was an accomplished watercolor artist, immediately suggested I take up watercoloring, but I didn't right away. She kept after me until finally, in 1996, I signed up for a community class at a local college on beginning watercolor. The first day of class, we painted a simple flower and were taught the technique of painting wet-on-wet. When my paint filled brush burst into the wet watercolor paper,… well, there's nothing like it … only a watercolor painter can understand. It was like magic to me and I've been hooked ever since. I put a #1 in pencil on the back of that first painting and my latest painting has #465 written on it's back. MBS: Having dabbled in watercolors as a mixed media artist, I definitely understand what you are talking about. But what is it in that one moment of spontaneity that you think keeps you coming back and back? Amy: Every painting is spontaneous. I may have a clear image in my head of what I want, and if I was painting with an opaque media, I could achieve that image. But with watercolors, I can't be sure what I'm going to get and I am always surprised. I can paint an area and then barely touch a new color into that area and have it completely explode into a brilliant starburst only to have it fade to pastel when it dries. I would call it interactive painting because it's a bit like playing a game. I make a play, then the paint makes a play, and then I react either with joy or a scream. I never know which. When I first started painting the fear of the paint reaction was very scary to me. I'd have a beautiful painting and would be afraid to ruin it. My teacher used to say, "It's just paper. Paint!" I'd get pretty worked up and have to take deep breaths and walk around the room. I would want to fix every blossom and every splatter, but now I realize, those can be what take a painting from ordinary to WOW! Happy mistakes. Coming from my graphic design everything-has-to-be-perfect background, it's quite a challenge for me to let go and let the paint do it's thing. And of course, I can always change it up by changing the paper, going from cold press to hot press to Yupo. Even the same brand of 300# paper reacts differently than the 140#. MBS: Your work reflects many different facets of the natural world around us, particularly animals and insects. What draws you into nature so much as a subject matter? 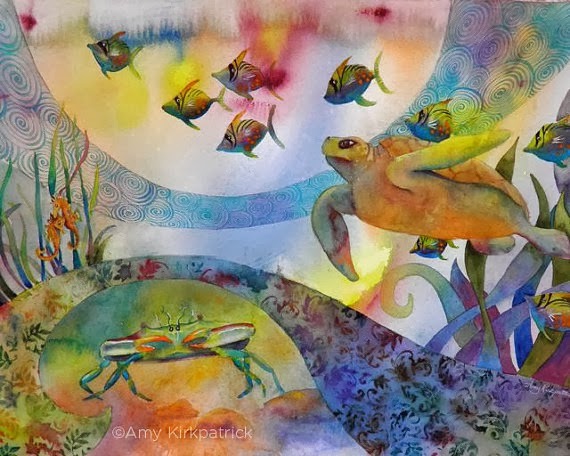 Amy: I mostly paint what I feel a connection to, but I also paint a lot of requested subjects. If I can paint what I like I feel it will magically appear on the paper. Of course, good drawing skills and a clean palette make all the difference. I enjoy painting animals because feathers and fur are spontaneous. I try to simply capture the essence of the feathers or fur and leave the detail to the face, and I love painting eyes. Well painted eyes give the animal life. wonderful people at Better Homes & Gardens Magazine. The first butterfly I ever painted, I sold on eBay the first hour I listed it, so I tried a second. BHG was doing a kitchen makeover, saw the second butterfly and chose it as the theme. They asked me to paint two more and while painting, I started my challenge of painting 100 butterflies in 100 days. I eventually ended up with 104 butterflies. I have recently completed a series of dragonflies and a series of sea shells, but again these were requests for licensing. You might be surprised that I really enjoy abstract painting. I haven't had much time lately to do them with all my requests, but I have a bunch. You can see a few here . My abstract paintings are never planned. I start with a pencil sketch and just go for it to see what happens. I have also filled several books with zentangle gel pen drawings that I love but I don't know what to do with them, yet. I keep my current book handy while watching TV. MBS: It sounds like you are able to somewhat balance the whole commission work vs "my" work dilemma that many artists struggle with. I know some people say..."oh it must be nice to get to that point", but it really can be an issue. Especially if the artist feels their creativity is becoming compromised. What are your thoughts on this and how do you handle that balance? Amy: Funny you ask that. I seriously love painting dogs and I did a big local campaign trying to get pet portrait commissions, but it just didn't happen. No one called. Not one request that wasn't a friend, so I sadly let that idea go. I don't get many commission requests from individuals, but when I do, I weigh it. Are they willing to pay me, do I have the time, is it something I can do, and I listen to my gut. Yesterday, I was asked to design a half-sleeve tattoo using one of my butterflies. I think tattoo design is a specialty and there are so many artists better suited for that, so I declined. However, if a company had come to me and asked me to design a series of tattoos for licensing, I would learn everything I could about tattoo design and do it. My art moved from being a hobby to a business with a clear, conscious decision I made. Several years ago, I got asked to illustrate every article of clothing in a clothing catalog. It was a huge project and I really wasn't sure I could do it. Before accepting the job, I asked them if I could take one home and give it a try, run it by them, and let's go from there. Of course, this was at my own expense. It turned out very well and created a lasting relationship. I ended up illustrating several catalogs as well as doing the graphic design layouts. Had I said no because it would compromise the integrity of my art, well, why not just go hit myself in the head with a frying pan... I'd have lost a lot of money! All artists need to answer this question, are you creating art for yourself or to make a money? There are millions of artists and everyone I meet tells me, their aunt, uncle, brother and sister is an artist, so logic tells me, not everyone can be the next big thing in NYC. MBS: Not everyone can be, but not everyone wants to be either. And that's hard for some to even imagine! lol What materials do you use when creating your artwork? Tell us a little bit about your process. 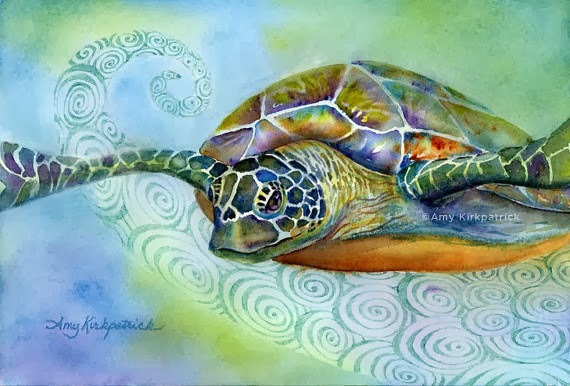 Amy: I use fine art watercolors and high end watercolor papers such as Arches, Saunders Waterford, and Fabriano. I mostly use cold press but lately I've been painting on hot press paper which is smooth. I use watercolor pencils sometimes, too. I mostly paint from photographs that I have taken, but I don't necessarily stay true to the photograph. For example, my peacock painting, "Hey, Good Lookin'" didn't have a a reflection in my photograph. I didn't do a pre-drawing but loosely sketched the bird directly onto the watercolor paper. I thought I had finished it but after walking by it for over a week on my shelf, I felt it needed something else, so, I added the reflection. Usually, I start by sketching a basic outline on drawing paper, then trace my drawing onto tracing paper and tighten it up. I don't draw every detail. Then I transfer it onto the watercolor paper over a light table. If it's a big painting, I'll tape it to a window to use that as my light table. Sometimes, I will use a grid system to do my drawing, especially if I am painting a face or have a lot going on in the picture. I try to limit my palette to five or six colors and pick them ahead of time. I usually paint the main subject first and then decide the background later. When I am painting abstracts, my process is different. I start with a loose, unplanned sketch directly on the watercolor paper. I usually choose just three colors but sometimes more and I just go for it without thinking too hard about it. I might add some collage and do some raised outlines with fabric or porcelain paint. MBS: Do you work on more then one piece at a time? In a series? What are you currently working on? Amy: I usually work on more than one painting at a time, and I have several that I may never finish. I never throw out a painting, no matter how bad, because I think I might fix it, even it means putting a coat of gold gesso over it and or using the back. I even save all the little scraps of watercolor paper to do my color testings on. I do work in series but not everything I paint has a mate. I completed a series of 6 flamingos earlier this summer. Most recently, I've completed a series of dragonflies, a seashell series, and am currently working on a hummingbird series. Except for the flamingos, I haven't released these paintings for public viewing, because I still need to do the watermarking which is time-consuming. I will get to it soon. Amy: Get up, have breakfast, and make a daily to-do list while I have my coffee. I then go into my studio where I treat my art business like a full time job. I start by checking emails. If I made a sale, getting that out the door is top priority. Then I start checking off my list. I prefer to paint in the morning, and then do my computer work in the afternoon. Computer work may consist of updating my Etsy store, my website, or scanning art and color correcting it for prints. I usually work until 5 or 6pm, but I usually check my email again before I go to bed. I don't paint everyday although lately I have been. I've been under a deadline for an art submission, and I am actually looking forward to a break so I can clean my house. MBS: I see that you sell your work online. What has your online/social networking experience been like in regards to your artwork and career? Amy: Selling online has been a double-edge sword. The positive is that I've gotten noticed. I'm still fairly new at marketing my art. 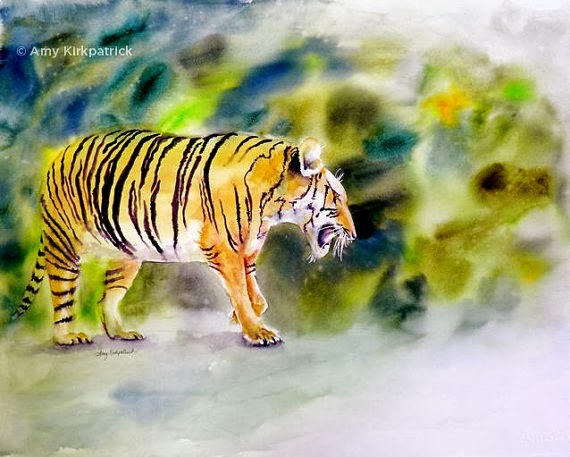 However, the possibilities for financial growth as a watercolor artist are very encouraging and being online has boosted my career tremendously. It's gotten me noticed by art buyers for licensing. Just this year, I have had approximately 50 paintings licensed and that wouldn't have happened without having my art online. The negative aspect has been the copycats. 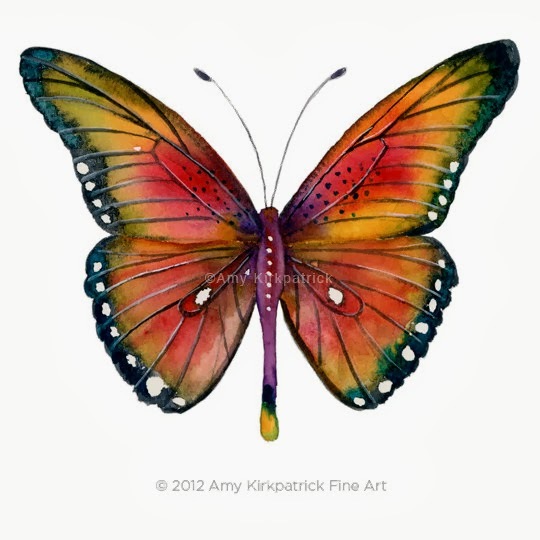 When I got the idea to paint 100 butterflies in 100 days, I googled painted butterflies and saw absolutely nothing like mine. I spent a lot of time researching Etsy and other art sites and again, saw nothing similar. I felt I was onto something fresh and apparently, so did a few other artists. You might say "copying is a form of flattery" but in selling art, it feels like theft. Being able to connect with people on a global scale has been a heartwarming experience. I've sent art orders to Viet Nam, England, Australia, etc. and it's always a thrill. I occasionally get fan email from far away places and have made friends with artists I may never be able to meet in person. I love how I can email an artist on Etsy and tell them "great job!" I set up a Facebook page when I first started marketing my watercolors and plan to take advantage of other sites. I see where others have pinned my art on Pinterest and that always feels like a nice pat on the back. 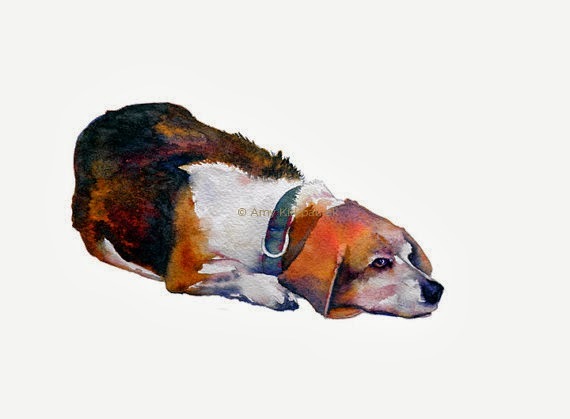 Without the online experience, I'm sure my watercolor art would still just be a hobby, shared with friends and an occasional friend of a friend. MBS: Where would you like to take your artwork from here, either creatively or from a business standpoint? Amy: Creatively, I have so many ideas in my head and I just need the time to do them. From a business standpoint, I want to get more licensing contracts in the works. I am a near-guru level Adobe software user and have designed a lot of overall patterns using my art that would look great on fabric, wrapping paper and gift bags. I want to see my art on all kinds of porcelain and paper products. My dream is to follow the licensing paths set by Laurel Burch and Thomas Kinkaid. MBS: What advice do you have for those who wish to (seriously) peruse an artistic path? Peruse or pursue? I'll assume you meant pursue. Amy: My advice would be to marry well! Kidding aside, the best advice I can give is to know what kind of artist you want to be and know where you want your art to go from an art business perspective. Do you want to teach, work professionally, license your art, or just enjoy creating and enter a show now and then. Bottom line, it all comes down to how much time and effort you want to put into it. There's a lot more to making a living at art than just creating the art you enjoy. Every self-employed artist needs to know how to survive the feast or famine lifestyle. Save your money during prosperous times for those times that it seems like you'll never make another sale. Feed your Roth IRA before you buy new clothes. You'll need computer skills and to know how to negotiate. Understand that if you are a self-employed artist, your fees have to cover your supplies, computers, websites, promotions, health insurance, self-employment taxes, social security as well as pay your salary. If art is your business, treat it like a business. Set goals and whatever art path you choose, strive to be the best you can be. Wonderful interview, and great advice! Amy's work is stunning! very nice interview! thank you for this!